We’ve been on a roll discussing painting interior wood trim and now we have a home with copious amounts of wood. And this lovely reader, Connie needs your help to decide whether or not she should paint wood paneling in a historic-style home. It’s an interesting story, but I’ll let Connie tell you all about it. I’m actually away and in my fantasies, I was going to save myself some time and just post her photos and let you guys have a go at it. And believe me, I’d love to do even more because this is my favorite period of architecture–Federal/Georgian, or there about. But instead after I post Connie’s images, I’ll post a few images from the period that her home is styled after. We recently purchased this home in November. It is in the “Old Town” section of Alexandria, Virginia. We are surrounded by historic homes, some dating back over 200 years. However, our row-house is relatively new (1976) and it was built on what used to be the stables/mews of the Lee-Fendall House (one of the historic homes in Old Town). So although this house is relatively new, it was built to blend with the surrounding historic homes and row houses. We bought this house for both the location and for its potential but pretty much everything needs to be updated. Nothing has been done to this home since 1976 and I mean nothing! We are talking mirrored soffits in the galley kitchen, and bathrooms with shell shaped sinks! The wood paneling and detailing in the living room was a major draw for us. Even in this area with historic homes, it’s hard to find that kind of workmanship. However it is a bit heavy and the wood has many knots. It seems as though it was lime washed at some point to tone down the orange tone of the wood. Fortunately the room gets plenty of light from the two French doors and a large window. I will be furnishing this room from scratch but before I buy a single piece of furniture, I need to decide what to do with the walls. or do I paint the wood paneling? If I keep the walls as is, I’m not sure what colors to bring in. If I paint the walls, I’m not sure what color to commit to. I tend to like lighter colors but I’m not sure if white is the way to go. I’m at a complete and total loss. “Paralyzed by Perfection” is what my husband calls my current state. I’m in desperate need for your help as well as your readers! Ooh! One more important fact! This living room is the heart of our home. It is well-used by my husband and I, and our two teenage daughters so it needs to be practical and not overly formal. Thank you so much Connie for your kind words. That is one seriously gorgeous home you found. There’s a ton of potential! But, honestly, I don’t know what I was thinking. If I were home, I would’ve spent 20 hours on this post because I love this period so much. The style of this home is from the Federal Period which spanned from about 1780-1830. The Lee Fendall Home was built in 1785 and aside from those decorative doo-dads on the portico is a fine example of that period. Undoubtedly, the Victorian ornamentation was a later addition. Ya know… Keeping up with the current trends of the day. But, let’s take a look at Connie’s beautiful Federal-style home, built in 1976. This is the same view as photo number one but a different time of day. The living room on an obviously bright, sunny day. I do see that the hall is white, wood trim and all. A close-up of the knotty pine wood paneling, that indeed, has been lime-washed. It’s difficult to tell from the images, just what color it is. And I color-corrected the darker images, because they were even redder than they look here. But I imagine the color is somewhere in between the more exposed images in the bright sunlight. Funny. We just had just been discussing a pine stain that is too red. In all fairness, the rooms are empty, but that’s a lot of brown. And if stay, will dictate the colors, a lot. There’s a photo in this post by Mark D Sikes that reminds me a lot of this room. I think that a predominantly blue and white scheme would be stunning with all of the wood. But lets look at some rooms from the Federal era to see if it is more authentic to paint or to stain the wood. I also included a few that are either English or American Georgian which started earlier, but is covered in this time period. There’s a lot of overlap in any case. This is a parlor at George Washington’s Mount Vernon home which was built a little earlier and is therefore in the Colonial Period, but it is close-by. I love how all of the painted wood paneling is only one color. An isometric plan view of Mount Vernon. Here we can see a mix of wood stain paneling and painted wood paneling. A Federal Government house in Maryland. Yes, too formal, but there is no wood trim in sight. This is lovely dining room in upstate New York. Although some might frown at the wood blinds, at least they didn’t use those overly formal, stiff swags and jabots; just not my thing. Doesn’t this valance remind you of Miles Redd? His valance would be deeper, but the same shape for sure. This house is also mid-18th century and is a fine example of the colonial period of architecture. Again, it is all painted ONE COLOR. This is historically correct. And it’s not that they never painted the trim white and the walls a color. They did that too. This home was built in 1920, but in the manner of the French neo-classical style. 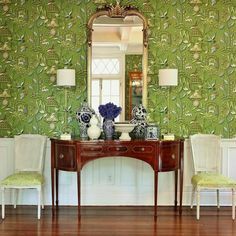 I am including it because if the wood trim stayed in the dining room, I would rather see a more complimentary color for the wallpaper. A 1904 home in Atherton, CA – built in the Georgian/Federal neo-classical style. beautifully renovated by Architect David-Buergler, Designer Dara Rosenfeld and builder-Paul Conrado. I’ll see y’all on Wednesday when I’ll be releasing the new blogging guide! I apologize because there were some server issues on Tuesday night, and some people had trouble getting onto the site. But my amazing techie, Tim Gary of Mindcue fixed in no time flat. The cure is a new caching plugin that also fixed the mobile site! Some of you mobile users may have noticed some wonky things going on, but it’s all fixed now. Sorry to beat a dead horse, but I just came across this photo on Ebay of well-done colonial-type knotty pine paneling. You can see how much finer the older paneling is, and how much more elegant the carving and milling. I am starting to side with those who are considering the option of reducing or removing the somewhat overwhelming paneling in the house featured in this post. I have been somewhat obsessed with this post and all the incredible comments provided by your loyal readers. In my previous post, I also suggested painting the pine paneling and maybe the ones in the dining room. After reading all the problems with covering knots, I fear the work will be overwhelming and maybe not successful long term. Then, I would refinish the parquet floors in a dark tone, maybe almost black. Again, I would think of the beautiful simplicity of the exterior, in black and white, and try to bring in more black and white, such as black and white tiles in the entrance. I personally would remove the commercial wallpaper (not hand painted) and then paint the entire dining room. I feel the wallpaper would not be a good background for art and beautiful wall lighting, such as brass sconces. Oh dear, I hope I have not suggested things which are too outrageous. I love the house but feel it needs to meet both a standard for good design as well as provide a welcoming environment for the family. I can see changing the fireplace insert and surround, but please keep the rest. At least consult a good painter and he will probably be able to take care of the knots and so forth. Oil based or shellac primer should seal them, and filling in any holes shouldn’t be too difficult, and definately worth the trouble! One reason real Federal homes had painted woodwork was to conceal such flaws, and to make it look more like the buildings of Greece and Rome. I think that would save what drew you to the home, and probably would cost less and create less dust and dirt anddisruption. Consider carefully because you won’t be able to go back. Thanks for your considered reply to my post of this morning. I agree about dust bunnies being more visible on a darker floor. And, if they use lovely rugs, most of the parquet look (re: several earlier comments about parquet floors) would be covered up! I agree it would be quite messy to tear out all the paneling. Paint WILL be perfect, if the knotty problem is solved. Connie, what a beautiful home! I would definitely paint your knotty pine! Doesn’t seem like the right wood for your beautiful paneling, so painting would hide that. Careful though, get a good painter! I once had a knotty pine bookcase wall painted white and the knots showed through, even after several coats. So a good primer for sure. Then maybe one of Laurel’s beautiful creamy whites from her rolodex. Even though chinoiserie wallpaper is beautiful and woukd match the historic period, it looks like this one has a ‘mirrored’ silver background- maybe a nod to the 70s when it was built? Not my favorite. I love Laurel’s post on grisaille wall murals- wouldn’t that be lovely in this dining room? I am about to move into a new home in California, wish I could do grisaille or wood paneling somewhere! But the textured wall/ great room Mcmansions we have here just aren’t suited to it. Grateful to have my new home anyway! Hi Connie! I have still been thinking about your predicament, because I have been there too, and (someone may have mentioned this) I think the reason that you can’t mive forward with the idea of what paint colors is you need something (art, fabrics, rug) to relate the color too. For example in the dining room you have the wallpaper, but in the living room you only have the fireplace. I think once you have chosen/have to use a painting, fabric, or rug, you can use that as a jumping off place to move forward with a color, then the room will come together and start to make sense. Oh man, I love Wedgewood blue! 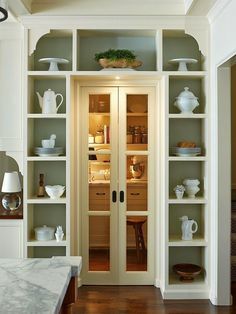 I spent my elementary school years in a house with kitchen cabinets painted that shade, and then of course a big collection of wedgewood in the dining room. Oh I wasn’t going to comment but then my mom said something to me last night when I asked for some advice and I thought it was brilliant. She said, “Genie, there is more than one right answer here”. Ha! so many times I have very extreme black and white thinking and I LOVE how my mom thinks…so very fluidly. Your house is UNBELIEVABLE, and I am so so jealous. I just bought an old Tudor house and I am trying to be grateful, but this is really the house of my dreams. Personally, I would paint if that is your heart’s desire. As one commenter points out, this is a replica rather than an original, so no crime will be committed no matter what you decide. I certainly think the knotty pine room should be painted, all one colour. Note that in Laurel’s first historical image the paint is all one colour, but it’s broken colour on the big panels, an important detail. It is essential here to use knotting compound to prevent bleed through: I promise that otherwise the resin will seep through and discolour 20 coats of paint in 30 years. Bright white is not the way to go: a “dirty” colour, such as F&B’s Shaded White, would be good. I recommend the blog “Modern Country” for its studies of F&B colours to get an idea of how such colours work. The fireplace needs a change too. Are the brass things doors? and if so, can they be removed to have a proper open fire? Ditto the granite, unsuitable to the “period” panelling, and the small tiled zone on the floor could be painted black to look like slate, which would be OK.
As for the chinoiserie paper room, either the wood tone panelling has to go (paint), or the paper. Depends on whether you like the paper or not. I don’t think it suits the room, but that’s just personal. I don’t think you need worry about the modern parquet floors. Provided you use large enough area rugs, they won’t be noticed. At the moment we look at them because the rooms are empty, but when there’s furniture, art, mirrors, they’ll fade into the background. One commenter says such floors are found all over Paris: yes, but not in older homes, only in 1960s-70s places. I like your home very much. I think the living room needs paint, the knotty wood which I would normally find charming seems to be fighting the design of the room. There should be one star there and it should be the beautiful architecture. I think….the fireplace is wrong? The brass seems jarring, I don’t know what I’d replace it with, a decorative screen? I live not too far from Alexandria, just over the river in Maryland. I, too, love and appreciate the beauty of Georgian/Federal architecture and furniture. Anyway, I’ve heard, from various sources, including tour guides at many of the historic buildings around here I’ve toured, that during that era, the only woods considered good enough to be left exposed were mahogany and walnut! (If you had enough money to live in a home like that, of course.) Knotty -pine paneling left exposed is probably more of a “neo-colonial” interpretation, rather than a true Georgian/Federalist detail. So Connie should not feel guilty painting it if she wants to- the colonists would have!The detailing is quite lovely and the home will be so beautiful, I’m sure, once it is decorated. As an alternative to solid paint, could the wood be whitewashed or lime-washed with a heavier coat, so more of the wood is covered and lightened, but a little bit of the texture is allowed to still come through? That way, you wouldn’t have to worry about covering all the knots up completely–it would just add to the character. You have a lovely house! You mentioned wanting to lighten the rooms up. I would pick a warm white from Laurels selection, maybe cotton balls or whatever works with your wallpaper, and then paint everything. A lot of the detail of the wood will shine through once painted that hides when stained, Plus it will really open up your rooms and make your floor look stunning. We had a brass fireplace screen and sanded it a little then painted it with stove black paint that withstands heat. It will change the look a lot. Maybe go buy a section of wide trim from a lumber store then try out a few paint colors on that to see how the dimensions look to you. I’ve read all the comments. Paint the living room for sure. Look for a timeless white that is not stark. Change out the marble and the strange red brick on the hearth of the fireplace. I’m on the side of also painting the dining room even though it has better wood. Isn’t that fact strange in itself? I would leave the dining room wallpaper if owners like and and paint it a soft color which plays off the wallpaper. If the owners do not like the wallpaper, paint any color desired, but I would go with the same white as the living room. Unlike many, I am not offended by parquet flooring. After other changes are finished, decide about refinishing the floors to better compliment what you have done. Yes, the house has great bones! I’m first inclined to save the wood in the Living Room, then seeing all of the lovely examples of paint that Laurel has posted, take that as your clue. Paint the wood trim and paneling accordingly. The fireplace does need some updating, and please, remove the marble from the top of the mantel. As far as the flooring goes, the outdated flooring drags down the room and is way too dark. I’d replace that flooring with a lovely wood. I agree with the paint all that wood idea. BUT – painting pine can be frustrating in the extreme, because those knots, no matter how much you shellac them, Zinsser them, etc, will never stop bleeding through. So – more radical/costly suggestion would be to cover it all up with drywall, or at least the more offensive parts. In reality, I’d probably feel swamped at the very thought and leave it as is. Well, this is a situation where you should follow Laurel’s advice and test, test, test if you decide to paint your paneling. I painted our living room paneling white, without really testing first, and it was not a good white for the room or my artwork. I have seen some lovely panelled rooms painted a soft delft blue or cream and they were beautiful, but that may be a color commitment you may not want to make. As a native Virginian (Richmond) and lover of Colonial Williamsburg, I have been exposed to this style of architecture my entire life. Williamsburg has spent so much time studying the period and even correcting their own errors as more information becomes available. The Governor’s Palace at Colonial Williamsburg is an excellent example. The Great Hall has always been stained but guess what – they discovered it was wrong for the period and just painted it. Their research revealed that during the period, rooms that displayed arms were painted so the displays had contrast. I doubt you have arms to display but you probably have art and that would seem to be the same issue. So here is your permission…even Colonial Williamsburg says it’s ok! Connie has a very beautiful home! I would paint the knotty pine woodwork in the Living Room. I would recommend a soft light putty colour like Benjamin Moore Abingdon Putty HC-99. (I would find white or blue on the woodwork too cold looking in this room.) It would be best if you could change the fireplace surround. It looks like there is also marble on the mantel shelf, which I would remove. Laurel has several posts that include ideas for hiding the TV, maybe you could use one of those strategies for hiding the TV over the fireplace, or maybe it’s possible to move the TV to another spot in the room (where it could be placed at a better viewing height), and place art over the fireplace. If you go with a putty colour, I envision ivory, light & dark putty/green, with a little caramel as colours for furniture & rug, with a range of textures mixed in. I’m extremely particular and my husband and I are using these two colors entirely in our newly purchased Reproduction Saltbox. What a beautiful home you and your family have found! I would definitely paint everything. The DR paneling is “better” than the ugly pine in the LR, but is not really great! The comments above point the way to a much more friendly home. I agree about trying to get rid of that dentil molding. The problem is, as I see it, there is too MUCH detail. The shadows within the dentil molding make it look too “busy.” However, if they cannot be removed, paint will make them look less obtrusive. What a magnificent home. I think the exterior look must dictate the colors, the tone of the whites, and the style of the detailing. Hi Connie! What a beautiful house. I also say Paint, Paint, Paint all of it. And as people have commented go with your gut. Take the risk, go all the way, I have done that with color In our house and it is amazing! Living room – I might look at a neutral with a green undertone (to coordinate with the fireplace) or again a color. Of course I love the idea of using historical colors like Laurel suggested. this problem does not have to be an all-or-nothing matter. first, ditch those dreadful parquet floors. combined with the divided light panels of the french doors, they create an eye-crossing jigsaw puzzle effect which would be even worse if they were lightened. so, out they go. plus, they really scream 1970s! next,change both the fireplace granite and brick to something light such as callacatta gold marble. add light and airy furnishings with some very dark accent pieces to create a visually pleasing interplay of multiple shade depths. this would allow the paneling to recede into a middle-shade background instead of overpowering the room. if she still feels the rooms are too dark, consider painting only some of the wood e.g. the interiors of the wall recesses, the fireplace surround, etc. Beautiful home and not to offend; I would definitely consider painting out the ‘knotty’ pine in the living room area as IMHO it is unfortunate they used it in the first place. IF not sure of the process; ask the advice of ‘a finish carpenter or someone experienced in woodworking’ for their expertise and ensure to mention that its been lime-washed. Secondly prior to doing so; I would be tempted to rework the design of the fireplace itself as well since feel the leg plinths are too massive. Also if keeping the current facing; replace the existing screen with something not as ornate and possibly change out the current brick hearth. As for the parquet flooring and presuming it is not a veneer or laminate; I actually love it with its mix of woods that always can be stripped (if waxed) or re-sanded (if varnished) and optionally stained and re-sealed to your liking. 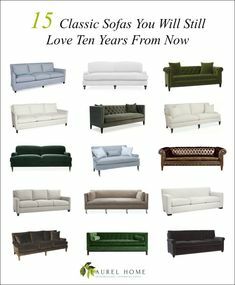 As for dressing it with area carpets (and not being an interior decorator myself) I feel much will depend upon your furnishings and life style. To conclude; wishing you success in your upgrading journey. You know how there is now a design trend for rustic wood – there was also a trend for it in the 70’s but it looked a little different than now. That’s why that wood is like that in your house and why it has all the knots. We recently painted our knotty pine paneled den and it looks AMAZING! The dark knots have NOT bled through. We first did a light spackling skim coat on the dark spots, followed by two coats of Zinsser Bulls Eye primer ( worked amazingly well) over all the walls. Some additional priming over dark spots was necessary and two or three coats of Benjamin Moore paint. Patience, sanding and attention to detail are key. 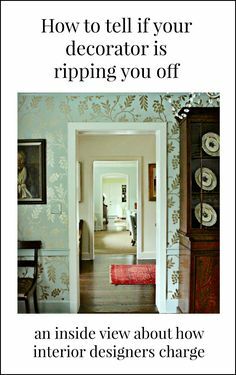 Young House Love has a great older post on painting paneling that was really helpful. Before we converted the Victorian school we had another house just down the street. It was a grade 2 listed Georgian town house built in 1720 ish. It had a paneled drawing room that had been stripped back to its pecan pine roots. I desperately wanted to paint as the room was dark but my husband said, no… we had also inherited a bright red axminster carpet ( also destined to stay). This was one of those old houses where you could be afraid of what you would find if you looked too hard under carpets or floors! Anyway, we sold it to a young couple, who promptly painted the paneling and ditched the carpet! From my not so discrete peeps through the windows it looks fab! So my vote is paint the paneling. Usually I would be indecisive about natural wood, however, not this time. Hello Laurel, I vote paint, and my personal preference would be for something in the white family. That wood does not look too high quality with all those knots, and the quantity is somewhat overwhelming. But on the other hand you did not show us photos of antique, original knotty-pine paneling. And I agree with Sandra–get the best painter possible! Paint all wood WHITE!! What a lovely home to work with. Great bones. I would not paint the LR walls simply because I am concerned that it will be very difficult to get a nice long term result with all those knots. The knots will need to be filled in with wood putty to get a smooth result and a few years down the road, they may show through the paint due to expansion/contraction during heating/air conditioning cycles. Instead, I would white wash the pine much lighter then it is currently. letting the wood grain show through. I would change those brass fireplace doors for black ones. I would cover those dated mid 70’s parquet floors with a neutral beige toned oriental carpet and use off white slip covered upholstered furnishings, I’d use blue patterned throw pillows. I’d re-do the display cabinets on either side of the fireplace with eye-catching blue and white porcelains. Finally, I’d use a low Chinese opium type table as my coffee table. I am in agreement with most of the ladies here — Paint the woodwork and paint it WHITE. You won’t regret it and painting the wood white is clean, modern, yet classic. Beautiful mansions in Beverly Hills have painted white woodwork throughout and it’s gorgeous! Looking at the above photos of “painted” woodwork, note how the very last photo image of the white woodwork is bright and open. The green woodwork is a gorgeous shade, but so dark, in my opinion. I love light and sunshine. With white woodwork you can have any color or style of furniture. A lot more flexibility. With other colors, you won’t have that flexibility. I am not an expert, Laurel is the designer, and I think her work is exceptional from what I have seen online. Connie, thank you for inviting us into your lovely home. It’s a big decision – to paint or not. I think the living room is heavy though and would benefit from paint. One issue I see is that the colour and style of the parquet floors clashes with the pickled walls. By painting the paneling, you can let the floors shine. I would also consider removing the columns flanking the fireplace. You could do lovely marble tile on the fireplace surround and hearth and either remove or replace the gold doors – or spray paint them black. That would lighten things considerably and feature the painted built-ins. What a lovely house! I would also vote to paint. We haven’t seen the other rooms but the living and dining would appear to benefit from a light color on walls and woodwork. paint. hire a superb, experienced painter. bring in the new! perhaps a local professional consult on palette. Paint for sure. Soft white in the family living area, perhaps soft green in the dining or pick out one of the colours in the chinoiserie wallpaper (I adore chinoiserie papers). Or even a deeper, richer version of what you paint the dining room, in the living, so a tonal effect going from one to the other? If using colour. I say paint and make it your own. Using colors you love but also go with the period. I love white woodwork but that is personal. I think the details will show even more without the knots in the pine. I find them distracting.